Super-simple creamy Italian dressing | Super-simple creamy Italian dressing – oh, that's tasty! Creamy Italian dressing is one of my husband’s favorite salad dressings. It’s getting harder to find in the grocery store, and the ones that we had tried tasted so fake and sugary — the side effect of making pretty much all your salad dressings from scratch. Then I found this one! The original recipe is on AllRecipes, but I’ve tweaked it to make it my own; I reduced the sugar and made a few other minor tweaks. 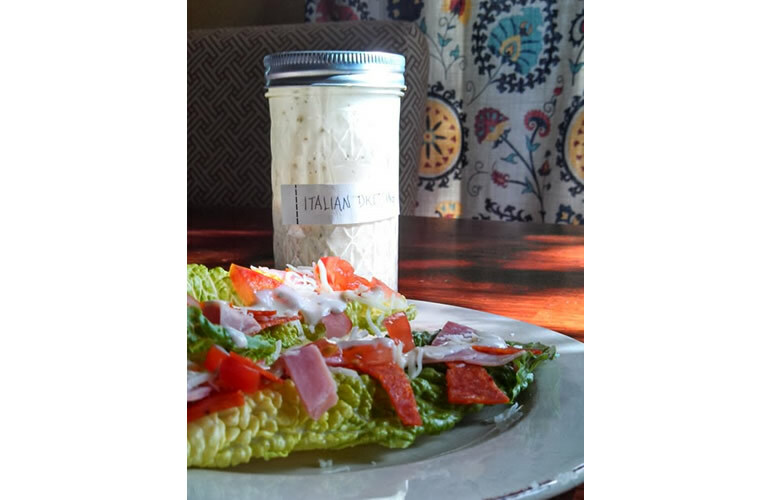 Make it without the sugar, and use homemade mayo, and you’ve got a Paleo, Whole30-compliant Italian dressing! Tried it; loved it; it’s a keeper! I made it as a spread/dip for homemade submarine sandwiches a couple nights ago. My husband still misses a sub that Pizza Hut used to have on the menu, which had a similar spread on it, and this recipe is a good fit. Then the next day for lunch, I had a sub-sandwich-inspired salad (shown in the photo above). Romaine lettuce with diced ham, pepperoni, and salami; mozzarella cheese, and diced tomatoes. And pickled onions — which are also a great sandwich topper. It’s really quick and easy to make. Tastes best if you make it a few hours or a day ahead, but I’ve made some notes in the recipe about how to adapt it if you need to serve it right away. Yay! No more store-bought creamy Italian dressing! Place the minced garlic and olive oil in a small dish and microwave for 30 seconds. Combine this and all the other ingredients in a 12 – 16 oz. jar and shake well. Refrigerate for a few hours; better overnight. *If you will be storing it 24 hours before use, you might skip the sugar. If you are living sugar-free, you can leave it out or replace it with your favorite sweetener. If you will be serving it right away, you might want to reduce the vinegar slightly and increase the sugar to taste.